2018. 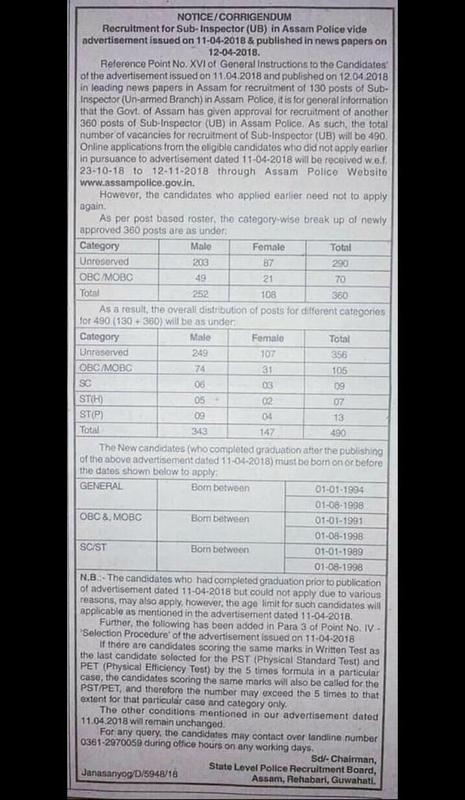 Candidates who are interested in this Assam Sub Inspector of Police Recruitment they can apply online before the closing date of 12-11-2018. Official website to apply online for this Assam SI jobs is www.slprbassam.in. Candidates selection will be based on written exam, Physical standards tests and physical efficiency tests for this Assam SI Recruitment 2018. 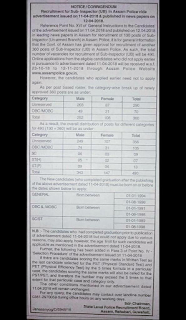 Detailed information about Physical Tests, Exam Pattern and Syllabus, age limits are given below for this Assam Un Armed Branch Sub Inspector of Police recruitment 2018. There are total 490 posts in this Assam Sub Inspector of Police Recruitment 2018. Degree qualification is required for applying this Assam SI Posts. Salary is Rs.14000-49000 with GP of Rs.8700/-. Written exam will be held for 100 marks. Exam will be OMR based and exam duration is 3 hours. Total 100 questions will be given and for each wrong answer 1/2 negative mark will be given. Exam paper contains 3 sections. In physical tests merit is mandatory. Merit physical tests will considered for final selection list. Candidates who are interested and good physical fitness they can apply online before the closing date of 12-11-2018. Official website for applying online is www.slprbassam.in.